WHAT GATE OPENING STYLE WILL BE BEST? How much space do you have available on your drive? Swing gates open inwards on to your driveway. If space is at a premium, meaning that parking space will be limited if you need to allow for swing gates then you may want to consider a set of sliding gates instead. In order to have a sliding gate installed, you need to have the equivalent space, the width of your gate to the side of your entrance for the gate to slide back against when open. Alternatively to traditional sliding gates, if you do not want to undertake groundworks across your driveway to lay tracking, you could consider using a cantilever system. This suspended way of operating the gate makes for a cleaner looking install and operates virtually silently. This is a really significant element to think about when choosing your gate. Not only do you need to choose a style that compliments your home but also, in some cases, the neighbourhood. 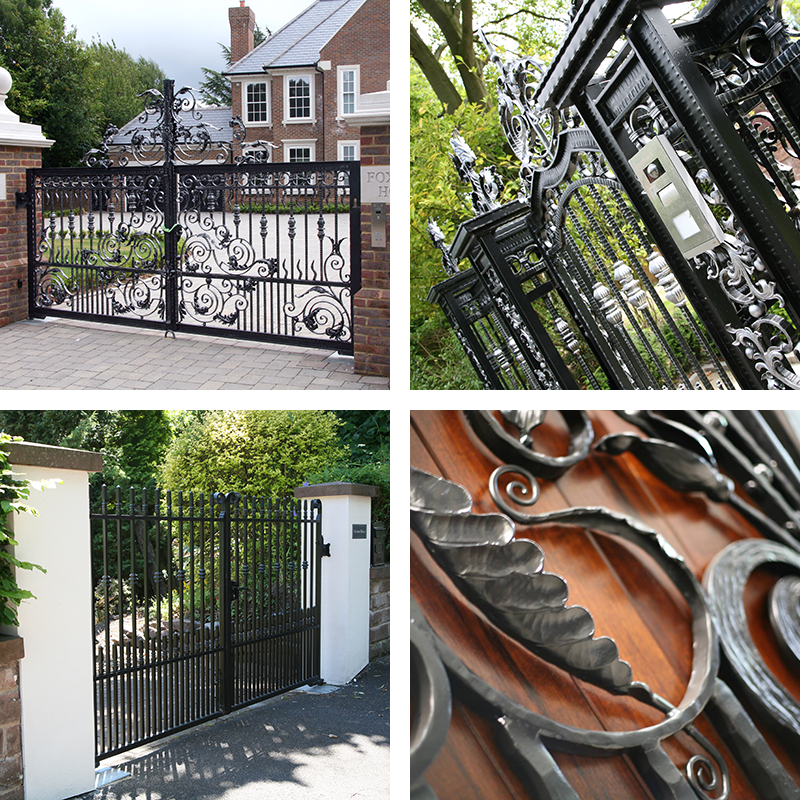 We have developed a series of gate designs which range from being very understated and classic through to extremely elaborate styles that you will not find elsewhere. The designs in our catalogue are used for inspiration and we have many more totally bespoke pieces that you can view. 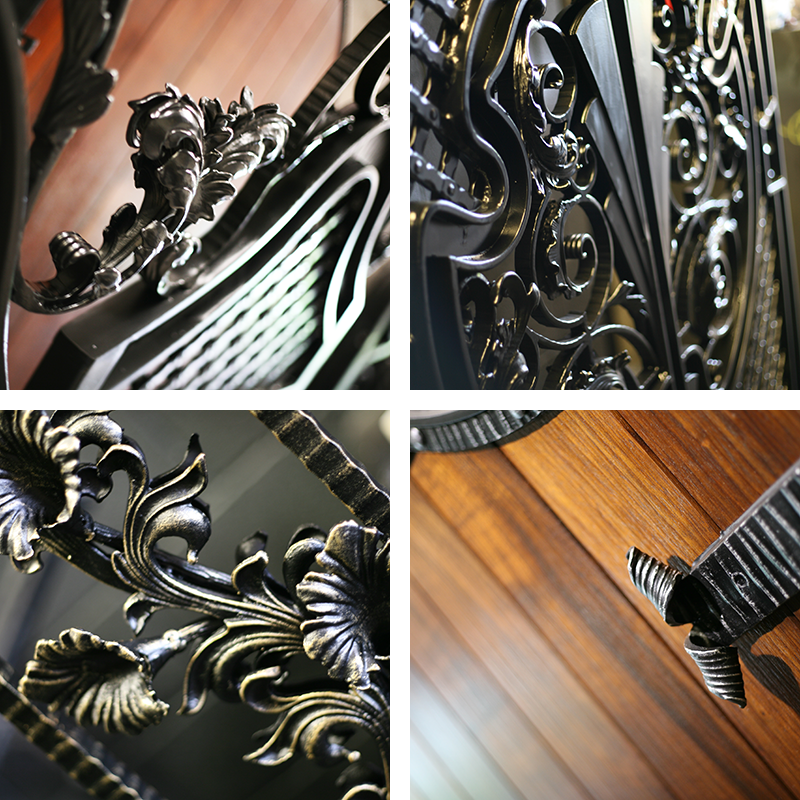 Because all of our ironwork is fabricated to order, we can create virtually anything for you. Regardless of what era your home belongs to, we have designs that will look perfect on Victorian, Art Deco, modern properties, country cottages and everything else in-between. You may need to take extra care choosing your design if you live in a conservation area for example. If you are unsure about any restrictions, you may be best to seek advice prior to purchase. In some circumstances, planning permission may need to be sought, especially if you are modifying or building pillars or columns. It is always best to check with your local planning authority if you are in any doubt of this. If planning consent is needed, we can provide you with CAD drawings to submit along with your planning proposal if required. WHAT WOULD YOU LIKE THE GATE TO BE MADE FROM? The traditional choice for residential properties are open patterned Iron gates. These can be very intricate or simple according to your design ideas. This type of gate is perfect for adding a layer of security to your property as a burglar deterrent as well as being a stylish addition. If privacy is a concern then consider a timber gate. All of our wooden gate designs are made with a sturdy steel frame and infilled with Frake hardwood. A closed boarded gate style not only enhances your home security but can also help to shield traffic noise in your garden if you reside on a busy road. If you live in an area which is prone to high winds then you might be best to choose open pattern iron gates or only partially clad gates if you still want the privacy screen of a timber gate. Wind resistance causes a fully cladded / closed boarded wooden gate to become an extremely large sail which would be inoperable manually (both physically & safely) in windy conditions and if the gates are automated, puts massive strain on gate equipment. Iron gates require virtually no maintenance once installed but wooden gates do require some annual attention that you may wish to consider. Our hardwood gates are treated with a UV protecting varnish that will help keep the wood safe from the elements. We recommend that each year the gates are cleaned, lightly sanded and another coat applied. This will keep them at their best for the longest possible time. If you are reluctant to undertake basic maintenance on your gates then you could consider aluminium infills instead. These look just like wood but you do not need to treat them at all. All of our wooden and aluminium infill gates are made with a heavy duty steel frame which allows us to create stunning and practical designs. 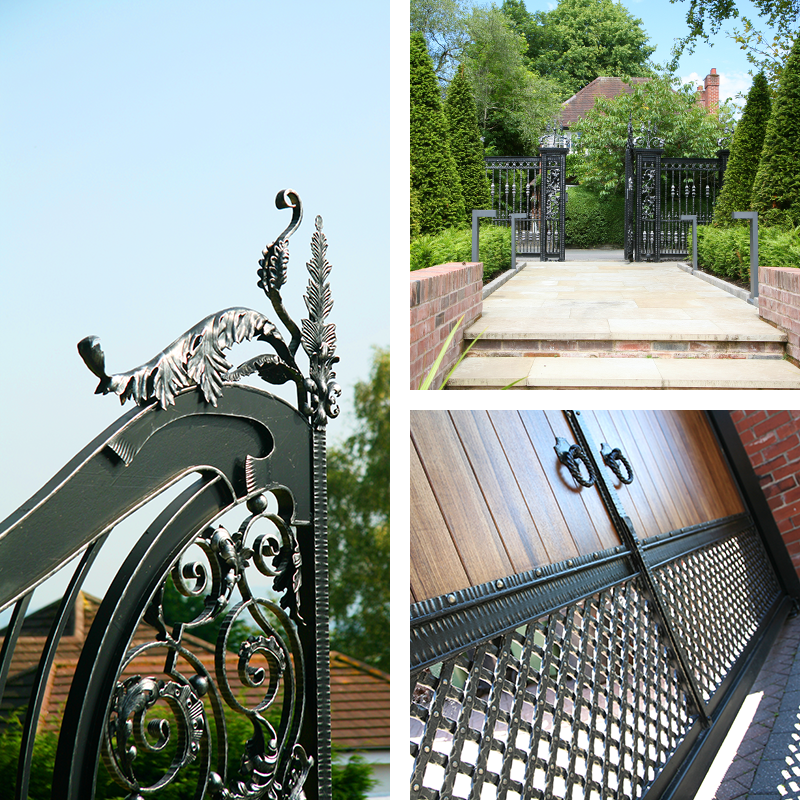 Regardless what type of gate you choose, all of our ironwork is galvanised prior to painting. This process involves dipping the finished ironwork in to a vat of molten zinc. Once complete, this provides the steel with a permanent rust proof coat which can be painted directly over. Your gates will last a lifetime after this process. Your painted ironwork will require an occasional clean with mild soapy water to keep it looking like new. DO YOU WANT YOUR GATES TO BE AUTOMATIC? This is all dependant on how you use your gates! If it is a side entrance that is rarely used or you have a pedestrian gate and on street parking then you may not be frequently opening your driveway gates. If this is the case then manual gates are suitable for that purpose. They could just have a simple latch and drop bolt or even have a locking handle for extra security. However, if the gates are going on to a driveway requiring regular access then it is best to have them automated, especially if your property is on a busy road where stopping to manually open your gates would cause a safety problem. 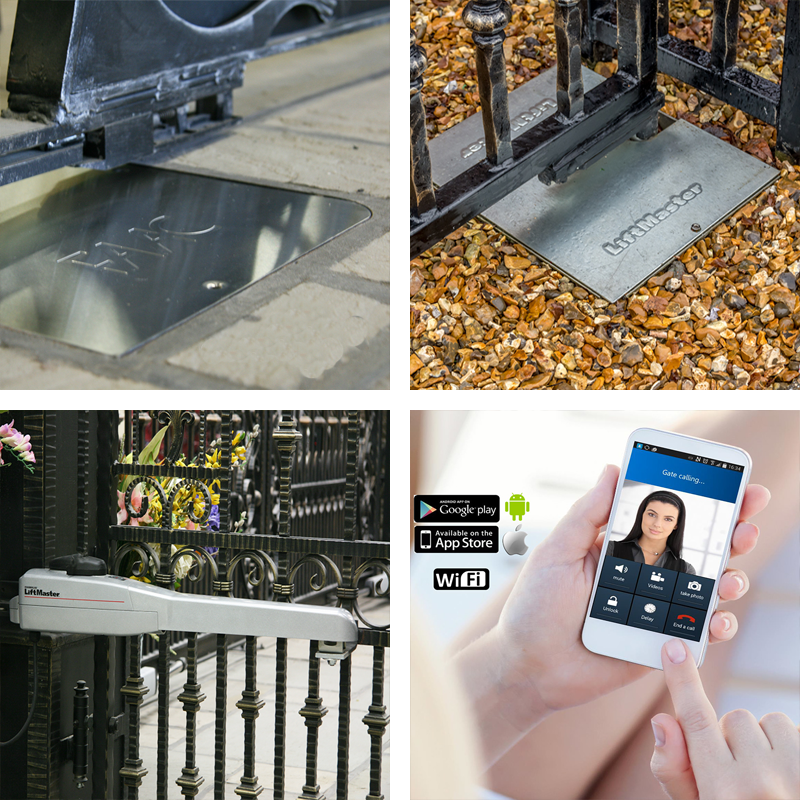 In addition to gate motors and their necessary safety equipment, there are a range of access control options which include video intercoms, ground loop exits, simple keypads and even GSM mobile phone technology. The best combination of automation and access control will depend on you and how you want to use the gates and control your visitors. We can discuss all your options with you to get the right combination for your requirements. HOW MUCH ARE THE GATES GOING TO COST? The general rule is that gates and railings which are of a bespoke design with lots of handmade, elaborate elements are always going to be the more costly option compared to a simple design using readily available components. It is worth considering servicing & maintenance costs if you are having your gates automated. A gate system needs to be serviced annually to keep it running smoothly and reliably. We offer both Silver and Gold Warranty packages which are particularly useful to keep your gates running and protect you from unknown breakdown charges. Not only does exterior ironwork make your home look well cared for and secure, it also adds value and sale-ability to the property with added kerb appeal, making it a smart investment. For more information or to discuss your options fully, please give us a call on 01282 677300.